I've been wracking my brain to post something "Easter-y" and am so uninspired. Once again, I haven't crafted anything for this holiday. I'm not sure what it is about the cute bunnies and eggs and chocolate that just doesn't strike my creativity. I am counting on your felted egg to bring our crafty conversation some Easter mojo, can't wait to see the results of your experiments! 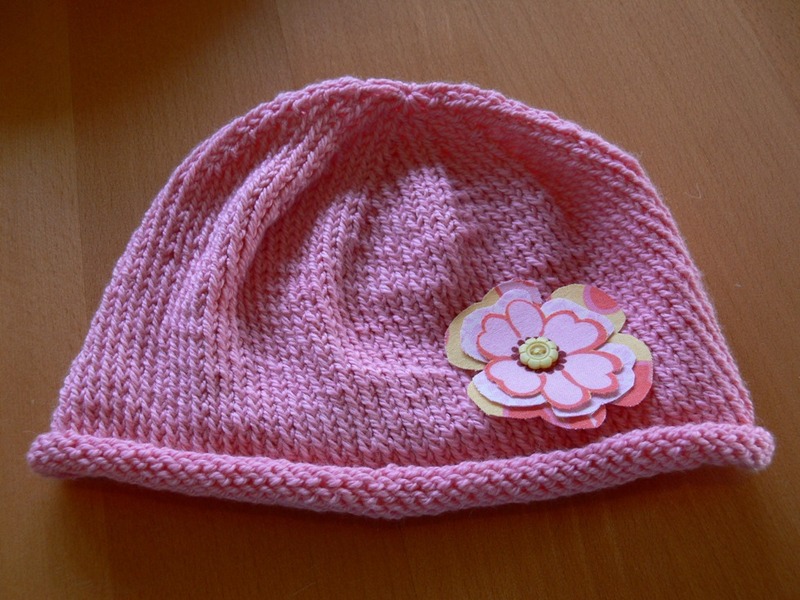 Instead of something "Easter-y", I'll show you a little "Spring-y" project I've been working on: flowery hats for my 2 nieces. 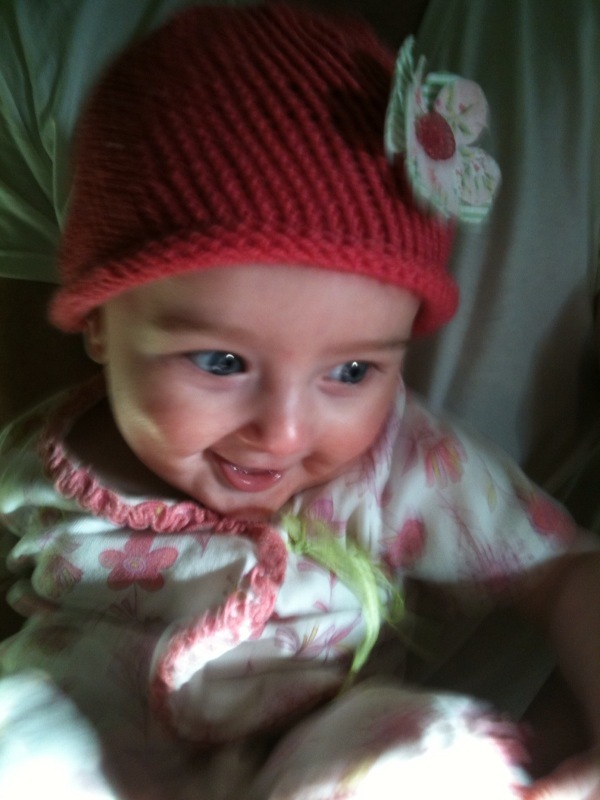 Violet is just 6 months and for Christmas, I sent her this little hat. 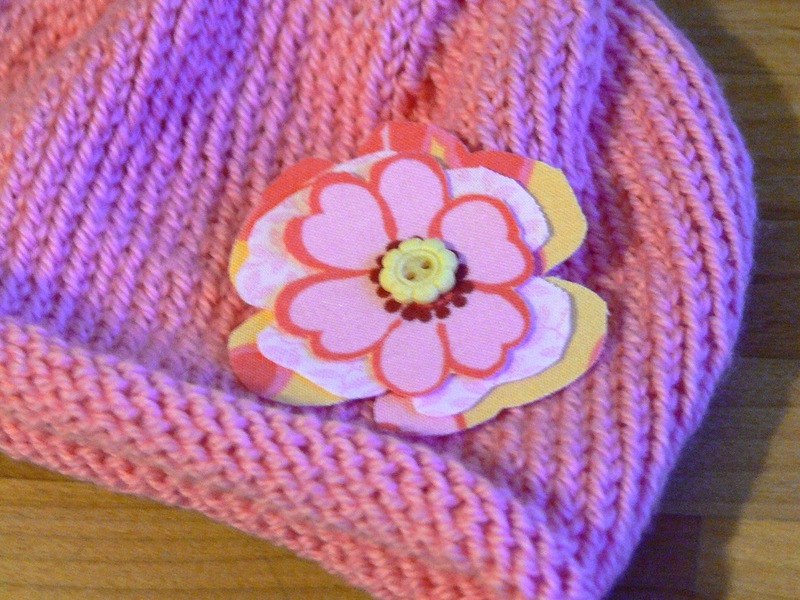 It's a simple rolled brim knitted hat (see instructions at bottom of post), which I embellished with a fabric flower and pretty button. I asked Violet's big sister Emma, who is 5, if she wanted one too and she did. 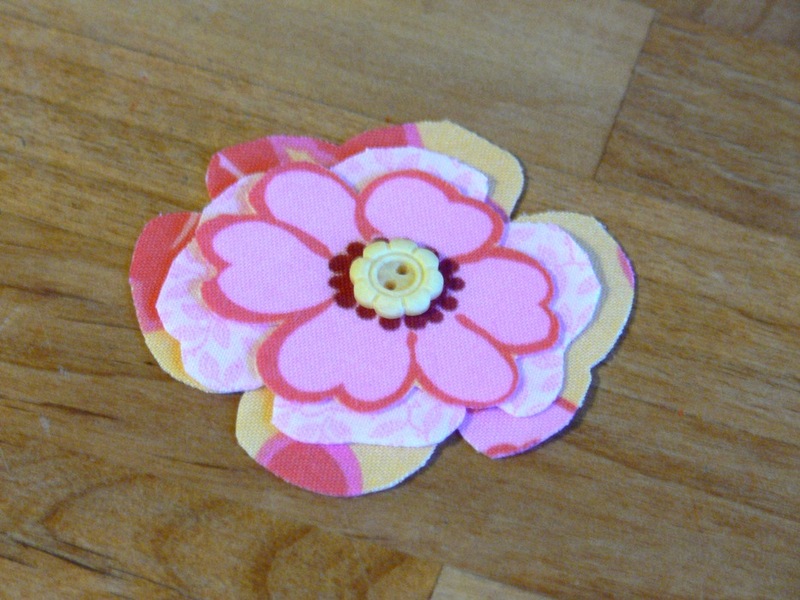 I took more pics of the flower assembly this time so I could show you how I made the flower embellishment. 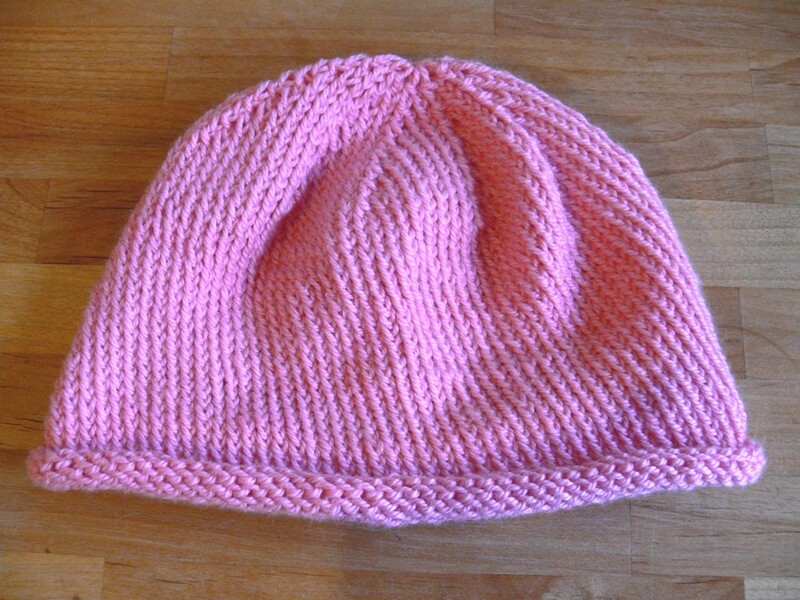 I made the same rolled brim hat, in a different pink and cast on with more stitches obviously. 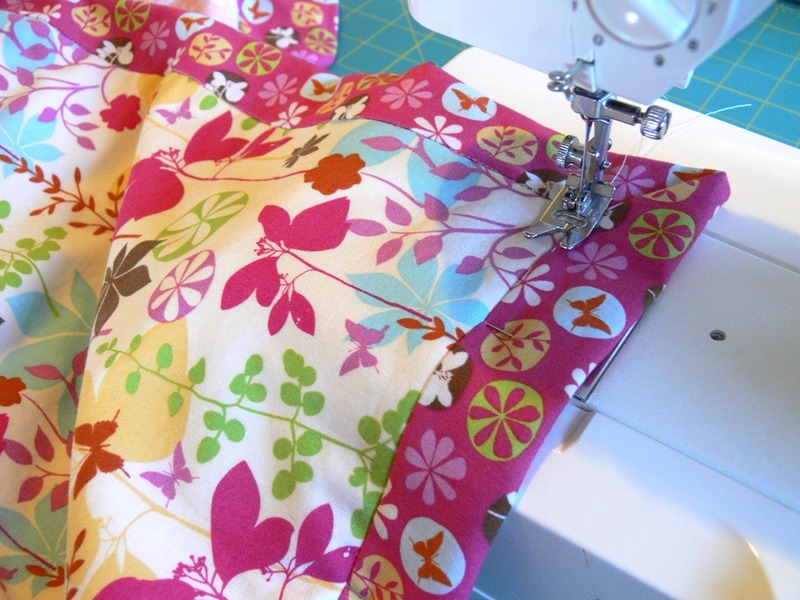 I picked my fabrics and buttons, then ironed some fusible interfacing to the back of the fabric. 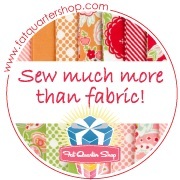 You don't need much for this, maybe a 5 x 5 inch square of each at most. 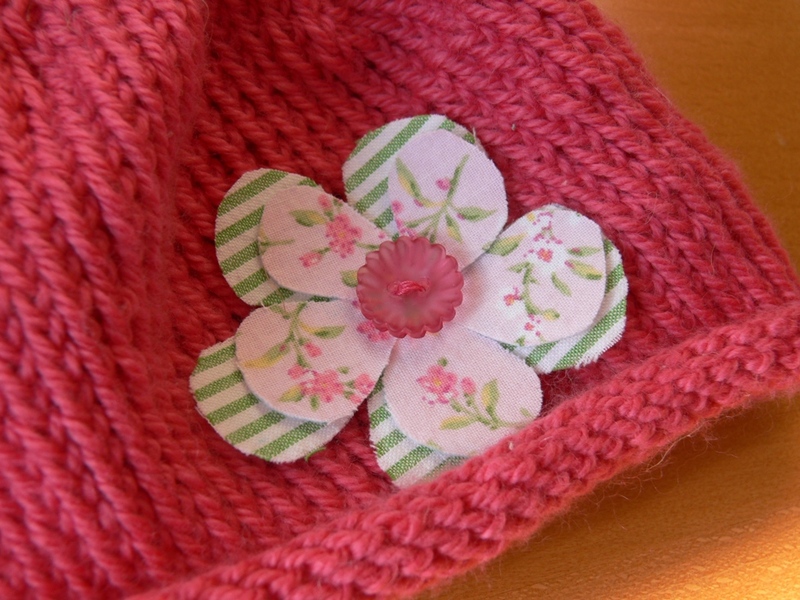 I placed the flower layers on the hat then stitched the button and fabric onto the hat with some embroidery floss. I used a tiny 1 x 1 inch patch of flannel on the inside of the hat to secure the stitching. I figured this would simplify the removal of the flower if needed. This is such a quicky project. 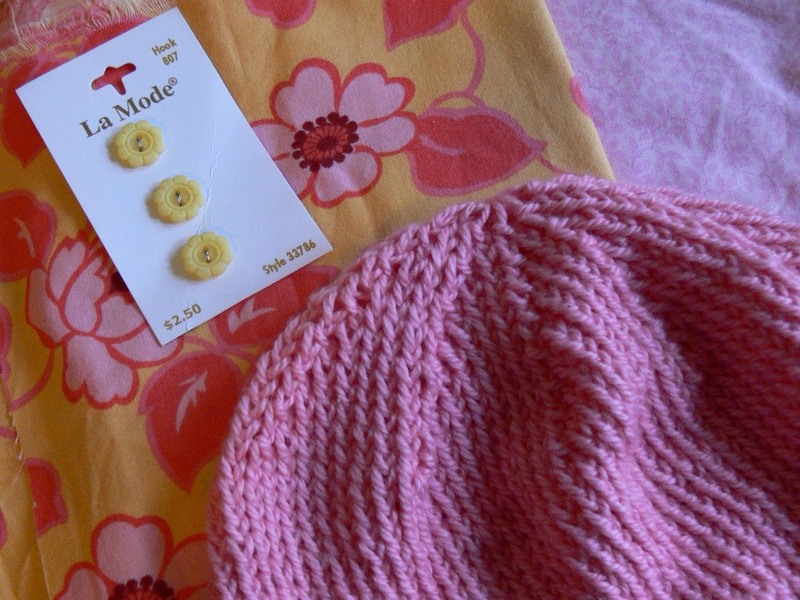 The hat only takes a couple of evenings to knit, especially the baby size. The flower is done in about 20 minutes. I do admit that the flower embellishment is not quite as polished and durable as I wish it were. I am thinking next time I make this, I will cut the fabric for each flower as a double layer and will top stitch around the edges. 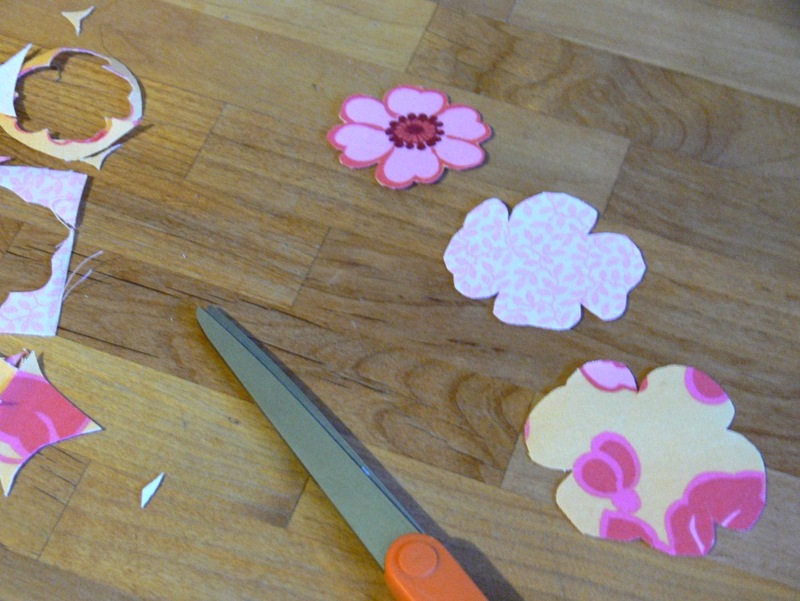 This will make each flower layer double-sided, and will add durability and prevent fraying on the flower edges. Overall though, I think the result is pretty cute for how quick and easy the project is. 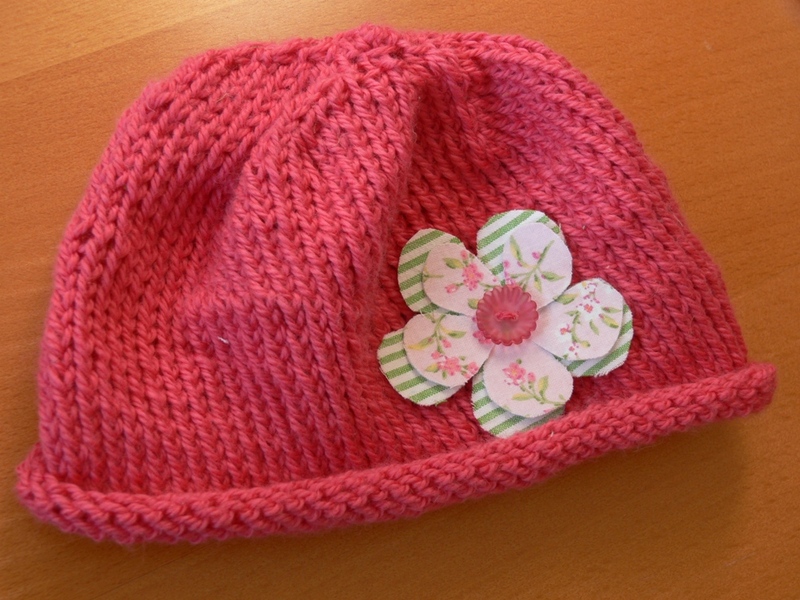 Here's my little pattern for knitting the hat. I made it up from mashing together several patterns I found online, according to the weight yarn I wanted to use, and the size I wanted to end up with. Newborn-6 months (3-6 years old): Cast on 72 (99) stitches, work in the round until hat measures 4.5 (7) inches with brim still rolled. Start decreasing with double-pointed needles: knit 6 (7), knit 2 together, knit 6 (7), knit 2 together and so on till end of row; next row, knit 5 (6), knit 2 together, knit 5 (6), knit 2 together, and so on till end of row; continue decreasing like this until you're down to knit 2 together, knit 2 together, etc, with no "regular" stitches in between. 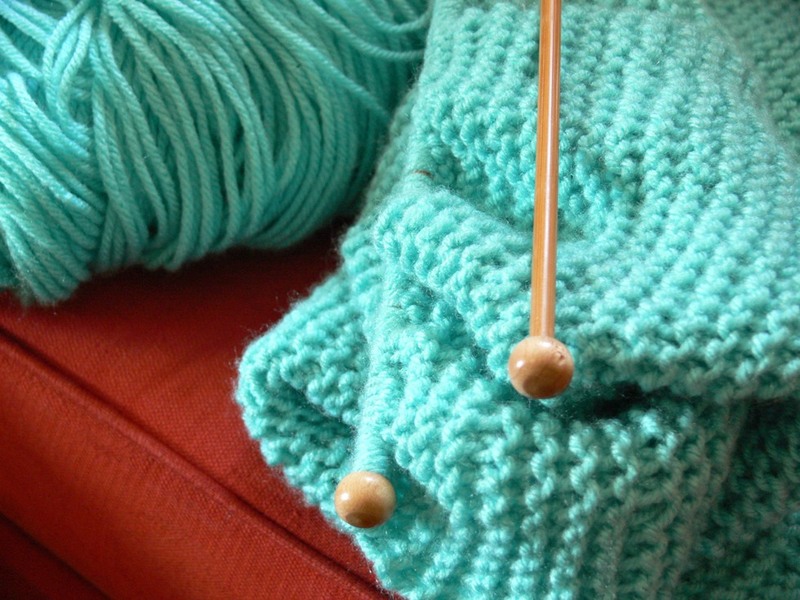 You should end up with 9 (11) stitches on the needles. 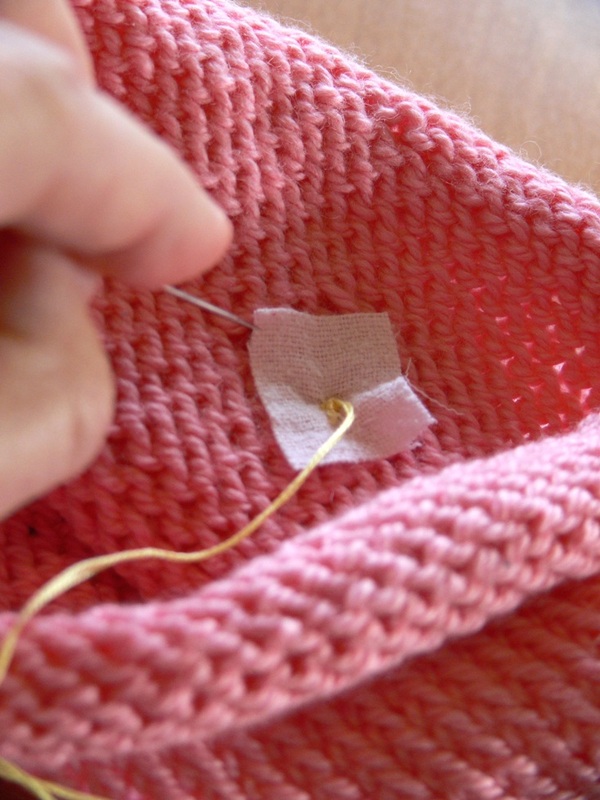 Using a tapestry needle, thread the yarn end through the remaining stitches and tie securely. 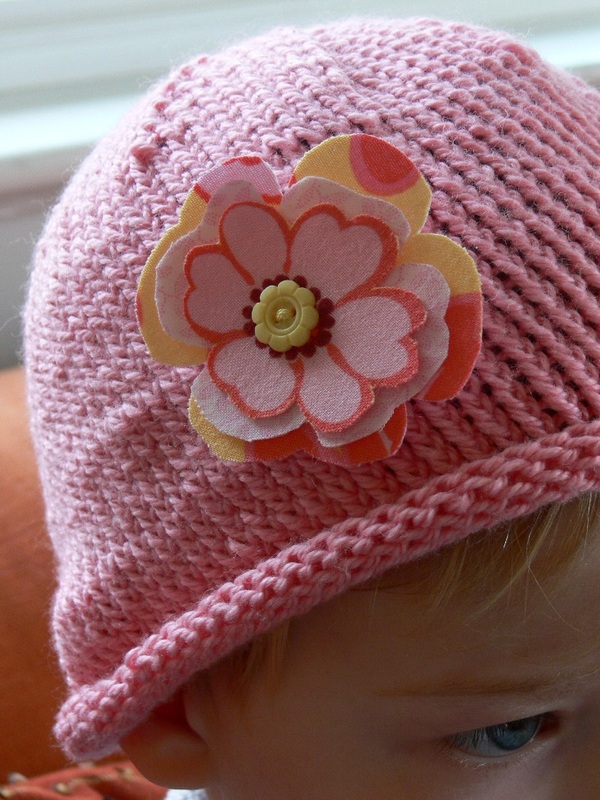 KnitPicks offers a great free pattern for this hat in adult size here. How can it possibly be Friday already?! This week has flown by. My mom is visiting, she just arrived a couple of days ago. As you can imagine, it's been a whirlwind around here, with Benjamin exclaiming "I yove you, Yaya" through the day. It's so sweet to see the two of them together! 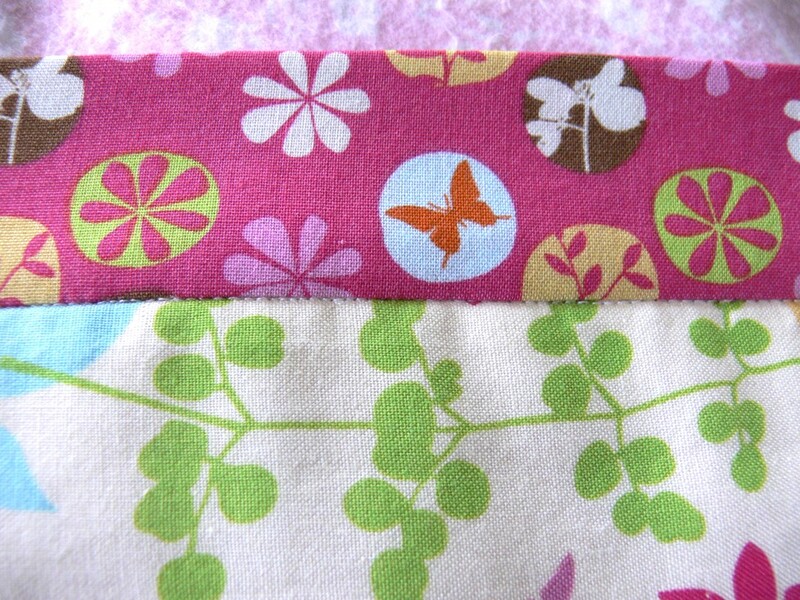 - Check out this sweet trio of fabric designed by Patricia at A Little Hut. 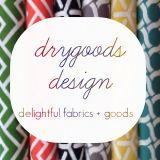 Available on Spoonflower. I heart the animal print especially! 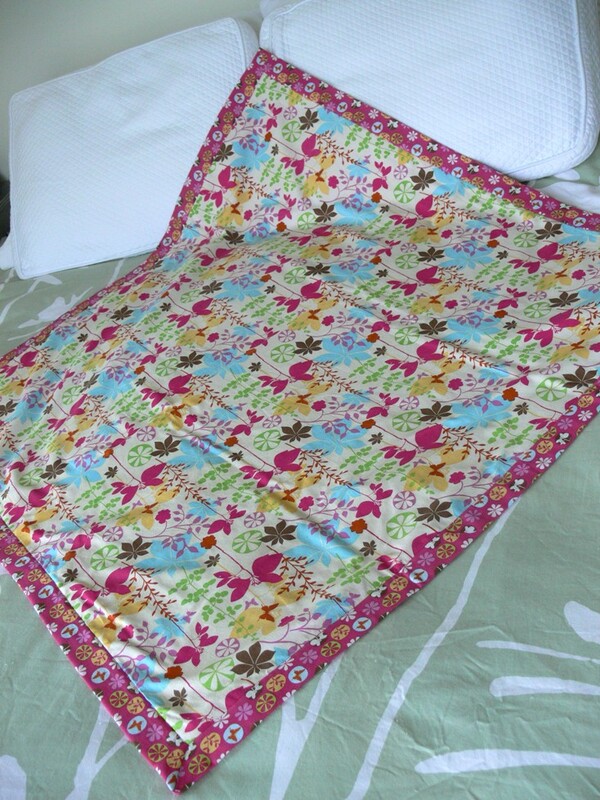 - Love, love, LOVE this pillow by Amy at badskirt. Wow! - Tasha McKelvey's pottery is so lovely and whimsical. I especially adore this little bird on a bowl. This one is pretty sweet too. - This hat is gorgeous, especially in that gray. 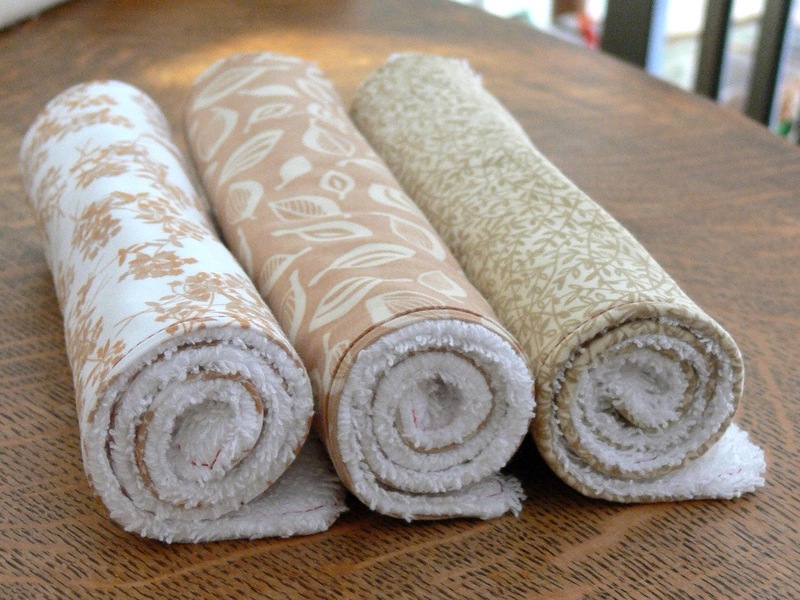 - Cannot wait to check out this new fabric shop, just a 5-minute drive from my house, woohoo! Sooo many babies around lately! It seems like every single one of my friends and family members has had a baby in the last 3 years or is currently pregnant. Needless to say, this has meant a lot of baby gift making in recent years, and more in the near future. Angel, do you remember when our group of mama friends decided to send homemade baby gifts to our friend Kelly? She had just moved to Colorado before the birth of her baby girl, and homemade goodness seemed like just the perfect comfort at such a stressful time. 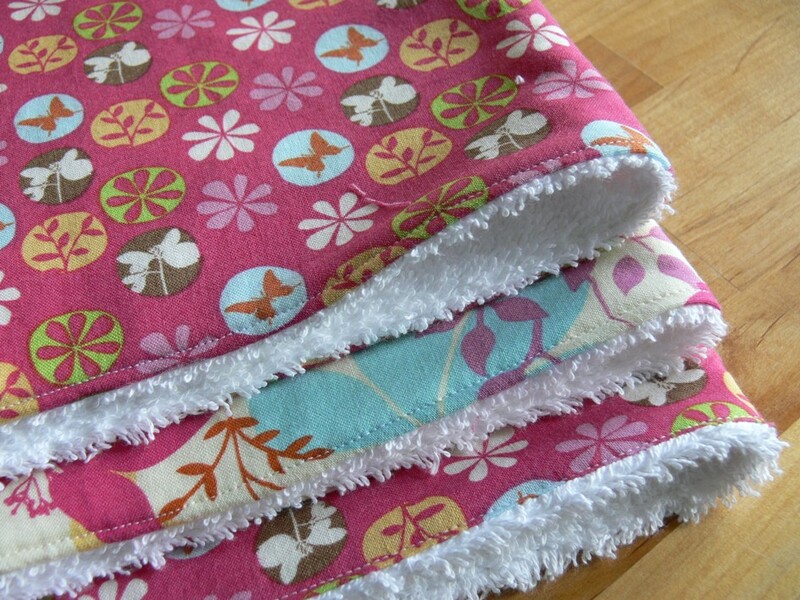 For my gift to Kelly, I made my first experiment in blanket-making. I mixed the Juicy Bits tutorial with a pattern for the Garter Stitch Blanket from the fabulous book Special Knits for Baby by Debbie Bliss. I knit the "body" of the blanket according to the Super Knits pattern, and added a border according to Jessica's tutorial. You can see my little homemade mish-mash notes above. With hindsight, this combo blanket may have been a tad ambitious, as I had never done binding on a blanket or quilt before. Working with knit material isn't the simplest thing, and the results were slightly horrifying for my detail-loving self. 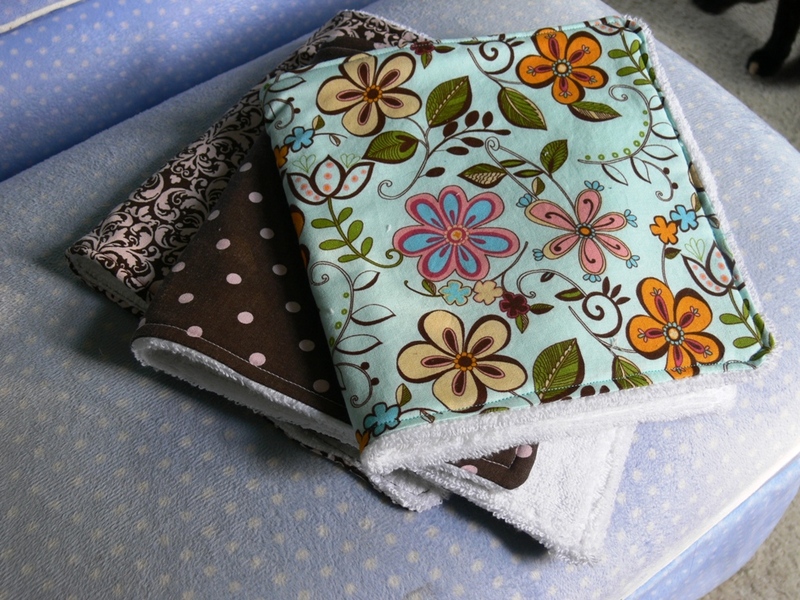 I made the burp cloths straight from the tutorial, thank goodness. 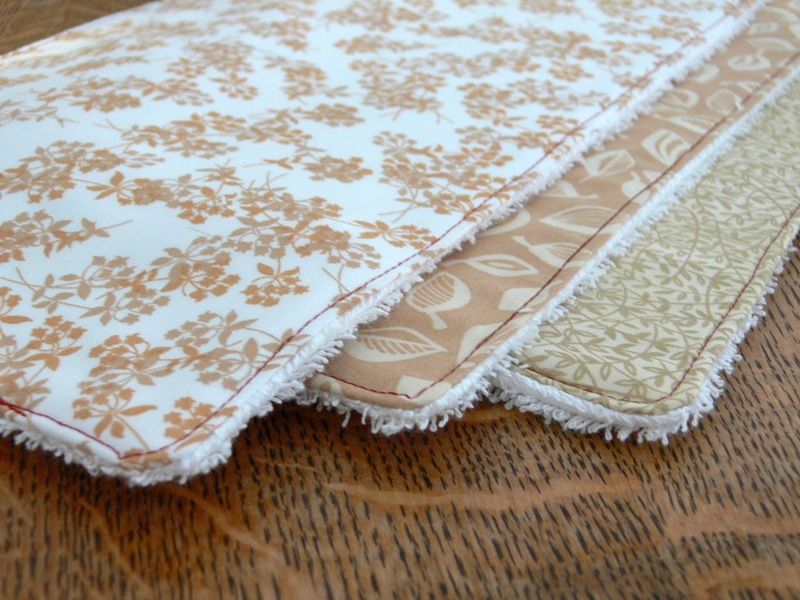 Having never dealt with binding or mitered cornered, I ended up stitching twice around the seam between the blanket and border, since the first time around didn't catch everything. 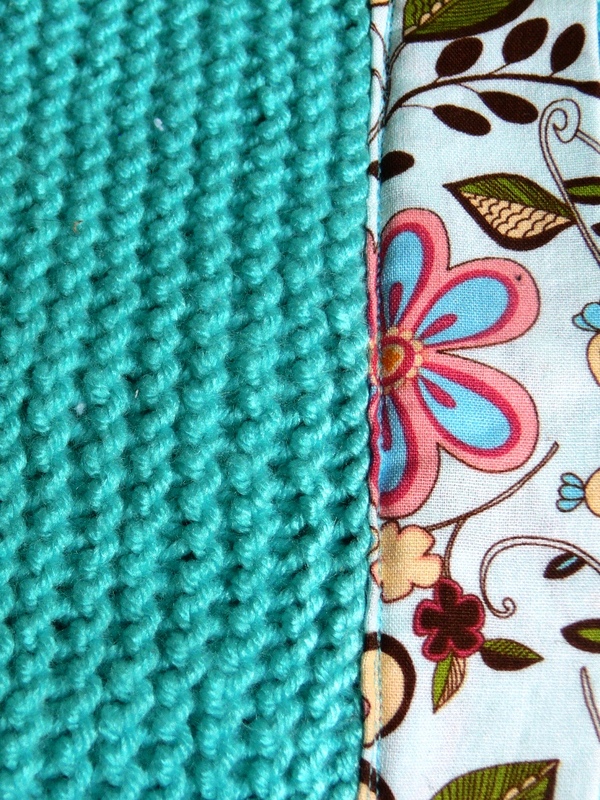 My sewed lines were not straight, and neither were the edges of my knit blanket -- loads of fun. 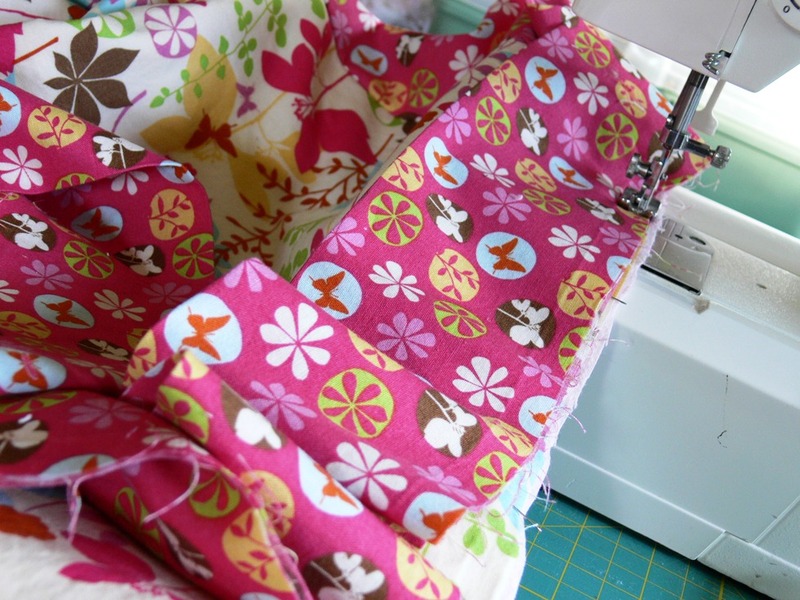 The off-kilter lines of stitches made me blush with embarrassment. But, by that point I had worked so hard on this gift that I decided to send it anyway. I kept my fingers crossed that Kelly wouldn't look too close and that it would keep her new baby girl warm in the Colorado winter!! I have to admit I really loved knitting that blanket. It was the perfect mindless TV-watching activity, and the result was cozy and substantial. 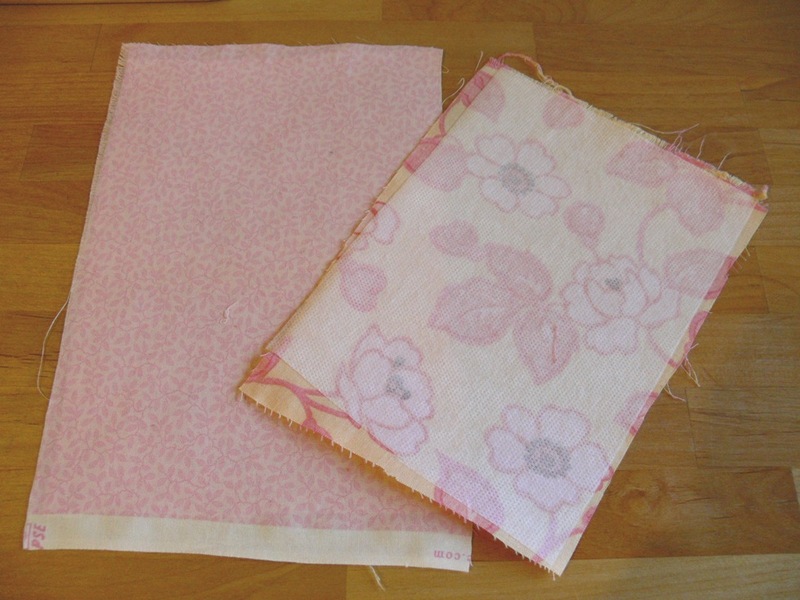 I really enjoyed the process and, now that I have more experience binding, will probably try it again in the future. 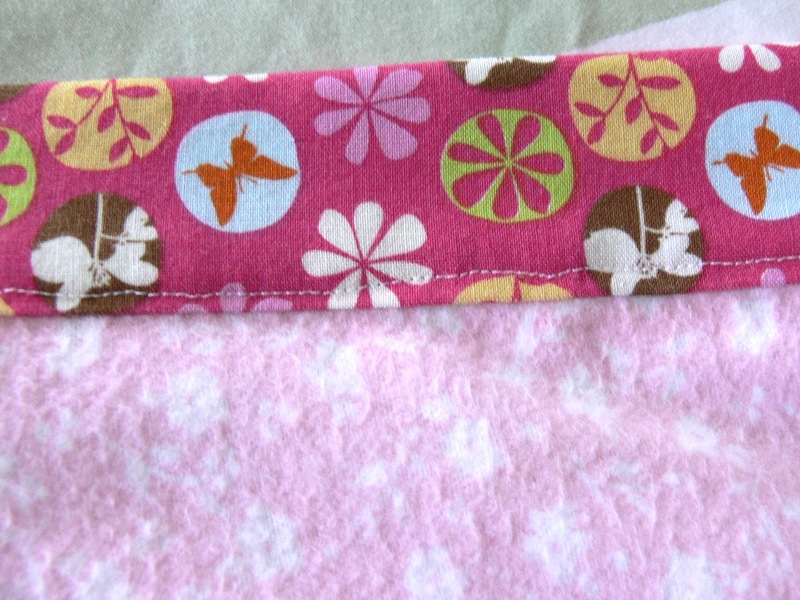 Those little burp cloths are super easy to make, and come in so handy when babies are spitting up 30 times a day, that I made some for my sister and for you too when Silas was born. (These were meant to accompany the little grandpa sweater I knit for him but that's a whole 'nother post.) I am not sure what possessed me to top-stitch in red. 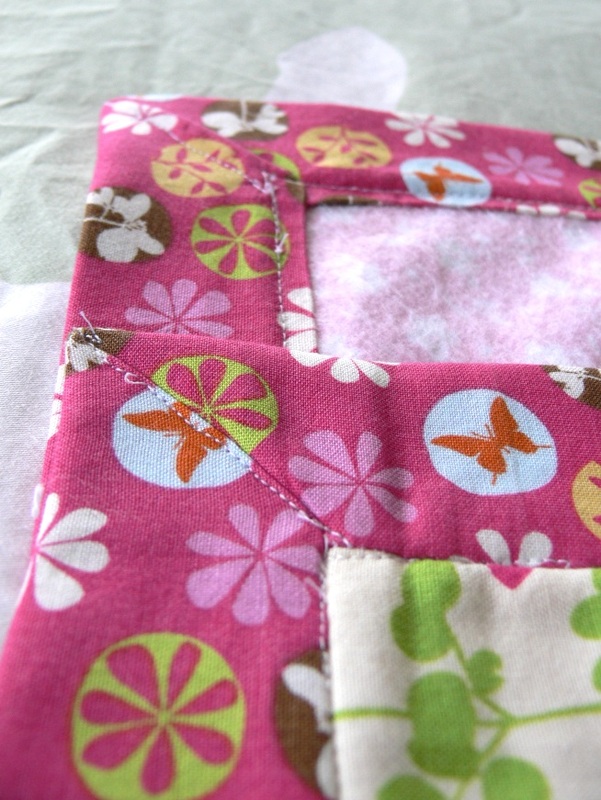 Not sure that was a good idea either, considering my trouble with stitching corners. Oh well. I hope Silas got the chance to spit up all over them!! Finally, last month I got to work on another set of blanket and burp cloths, this time for our friend Ginger who is expecting a little girl. 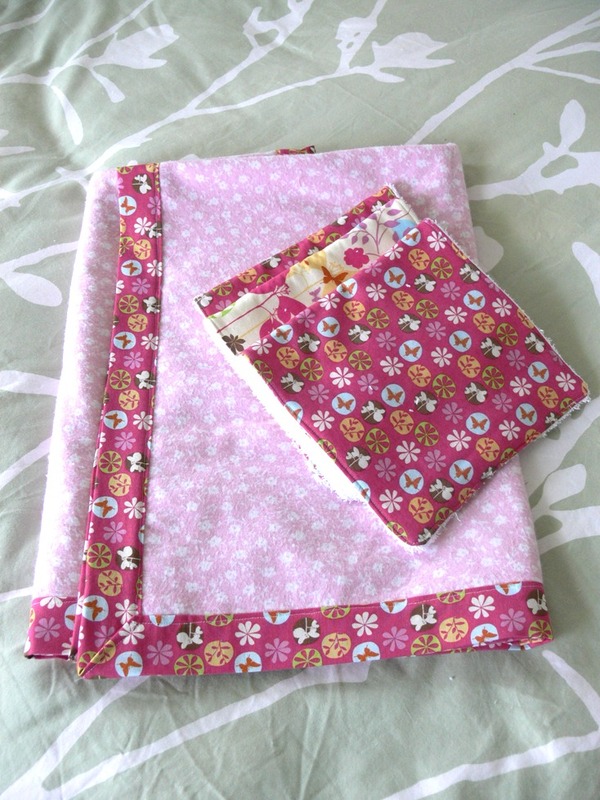 Following my resolution to use stash fabric, I selected a sweet pink flannel for the backing and a combo of butterfly/flower fabric I love. I think I bought those prints at Hobby Lobby a couple of years ago and have used them for several little things. 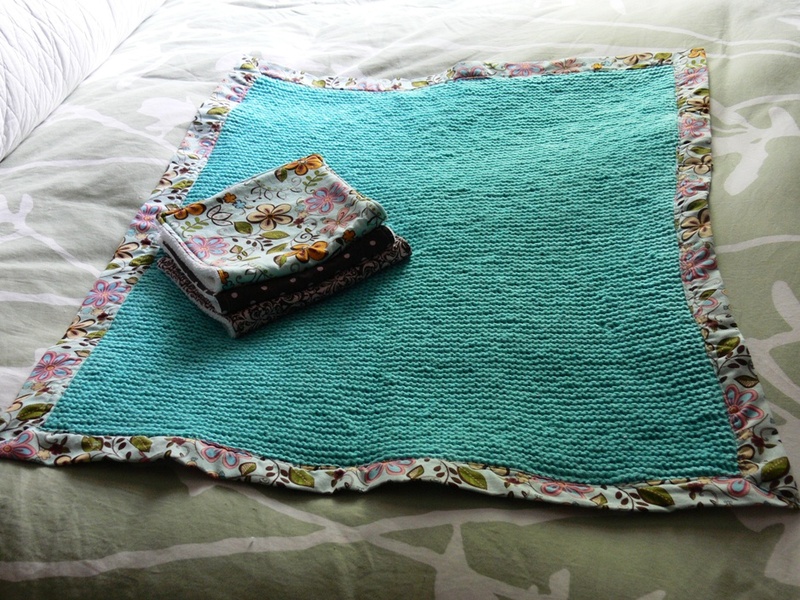 The blanket is a good project for featuring some pretty yardage. I followed Jessica's tutorial to a tee this time, with much nicer results. Oh wait, I did substitute flannel for the minky she uses in her tutorial, and I added a layer of flannel in between for bulk. 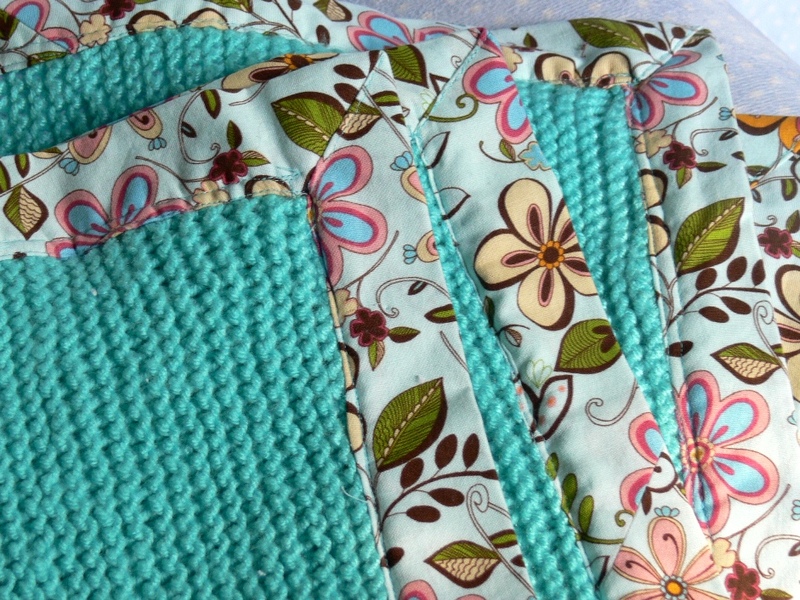 As for the blanket... Let's just say I still have a lot to learn about properly attaching my binding. 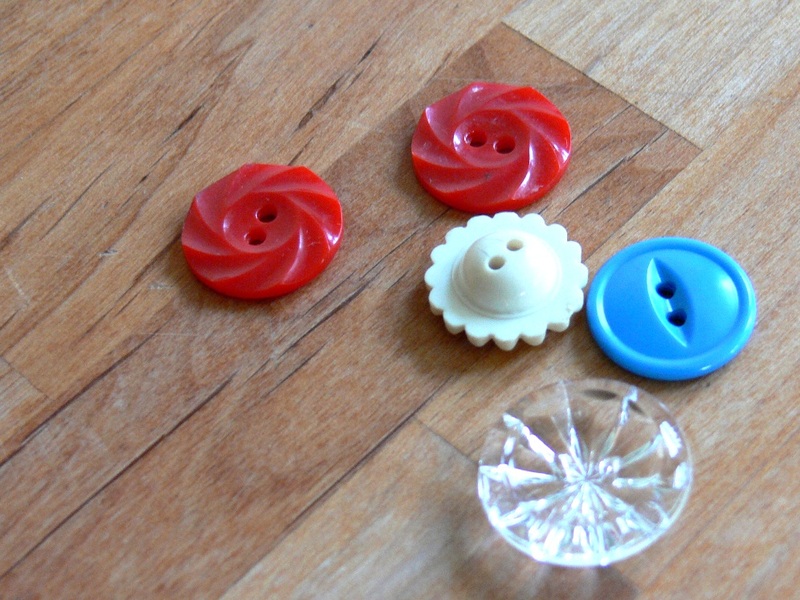 Paying close attention to the Juicy Bits instructions for pinning helped me quite a bit. But, sewing in the ditch is much harder than it sounds. 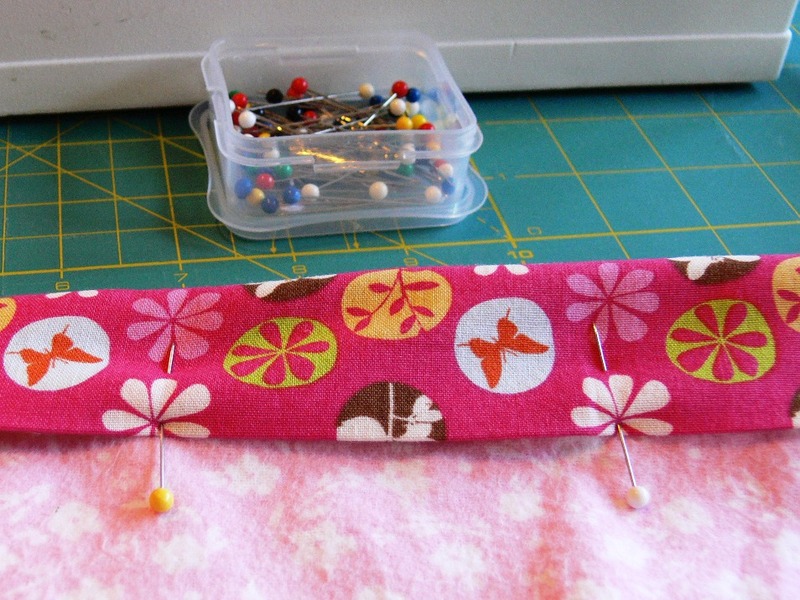 Again, I can't seem to sew in proper straight lines quite yet. Does one ever master this?! The corners were okay, but kind of messy. I need to pay closer attention to the color of my threads, the corners should probably have been sewn in a matching fuchsia. Overall, I was pretty pleased with the result. 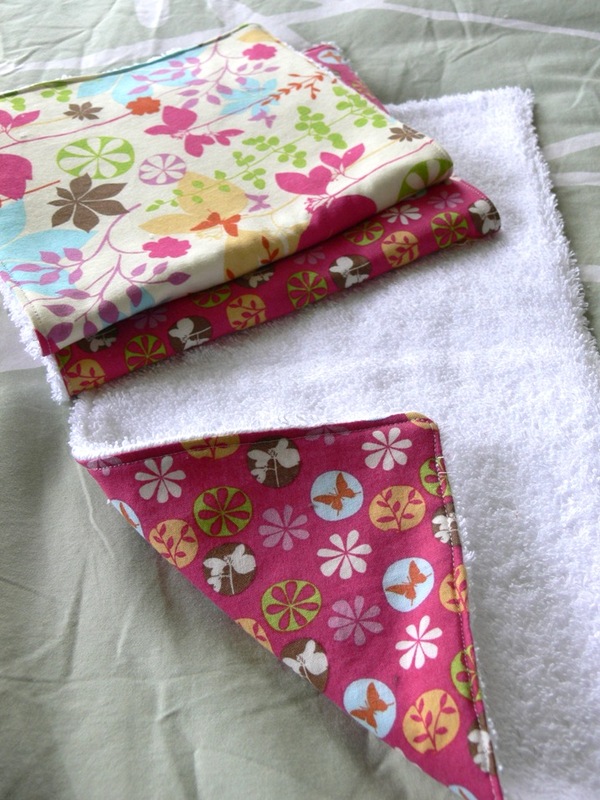 I think I would have liked to receive this blanket and burp cloth set as a gift. I hope Ginger gets to use and enjoy it with her soon-to-arrive baby girl! Wow Jenny! I can't believe how productive you have been. I am inspired. 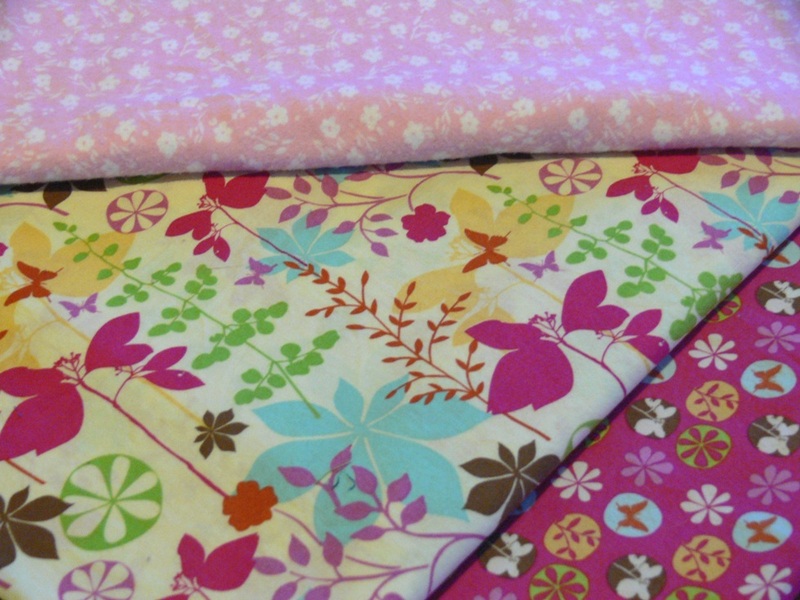 I love the "girl" fabrics so much! We have gotten a lot of use out of the burp cloths you gave Silas, they also work great as a small changing pad so I usually stick one in my bag with a few diapers if I'm going out with the baby. 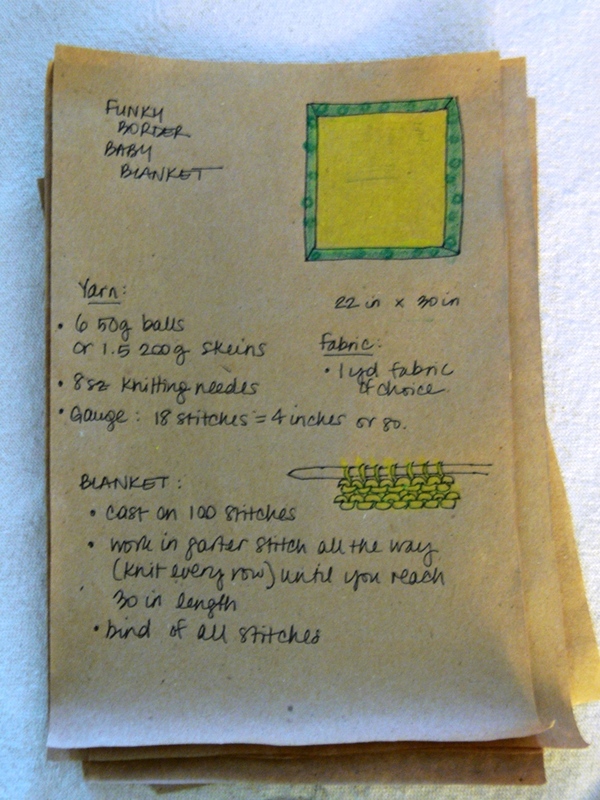 I love the knitted/cloth blanket concept, I am going to give that a try next time I have a baby to "make" for! Ask, and you shall receive! 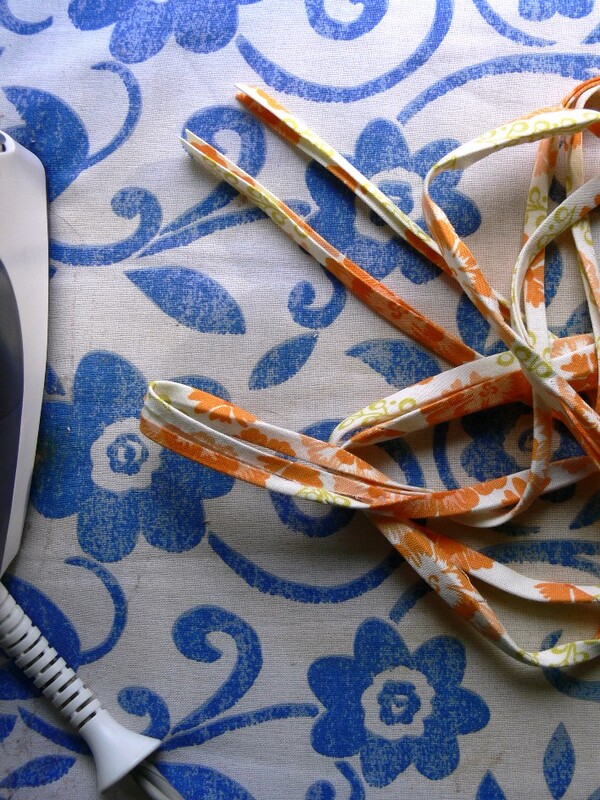 Here's my little tutorial for making your own bias tape. Quick disclaimer: I'm no pro, and I quite dislike making bias tape. 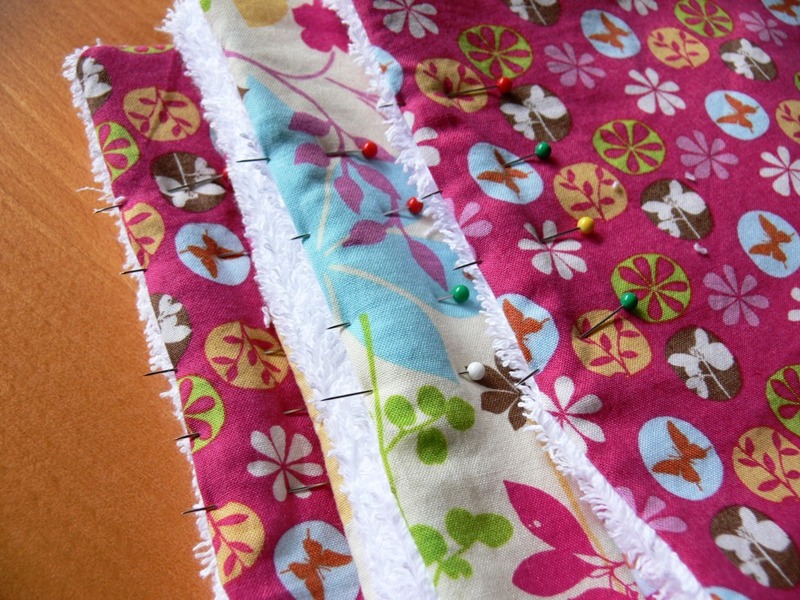 But, I do love being able to personalize projects with a homemade trim, that is cotton (as opposed to the common polyester bias tape found at your local fabric store), cheap (as opposed to ALL bias tape for sale) and unique (made with the fabric of your choice). 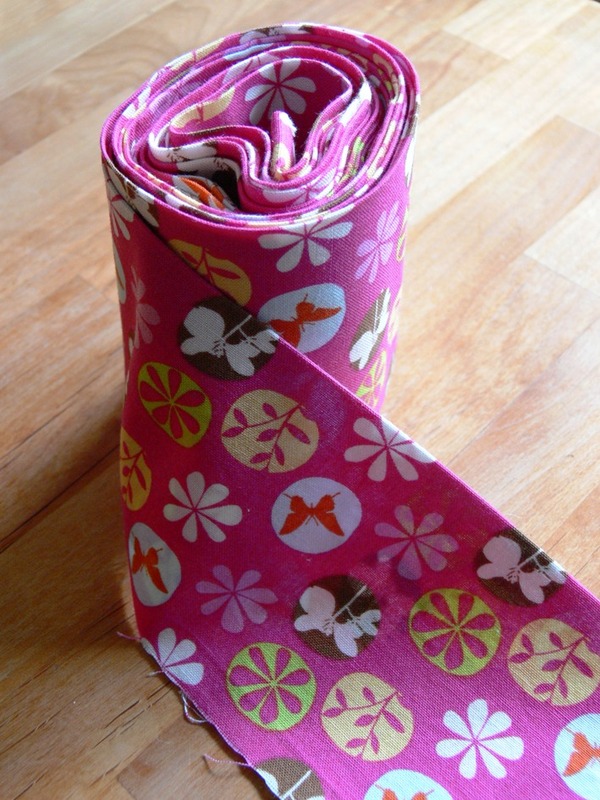 For these reasons, it is well worth knowing how to make your own bias tape. 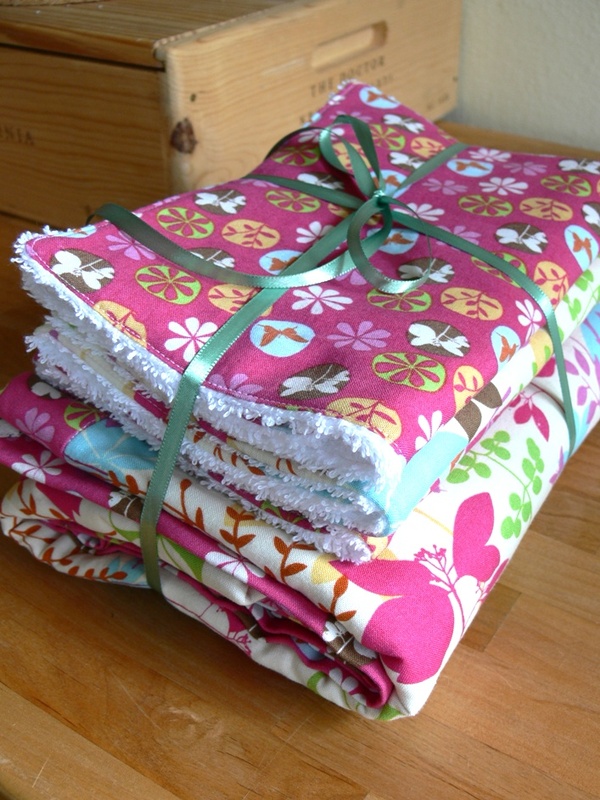 Petite Purls (online magazine): not sure how I missed this before, but it looks like a great magazine! Welcome back! 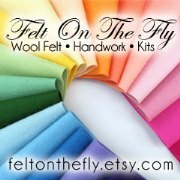 Funny, I pinned and bookmarked all the same things this past week, aside from the felted egg. Speaking of which, have you seen this Wool Felted Egg tutorial on Frontier Dreams? Can't wait to see the next update on the renovation!! 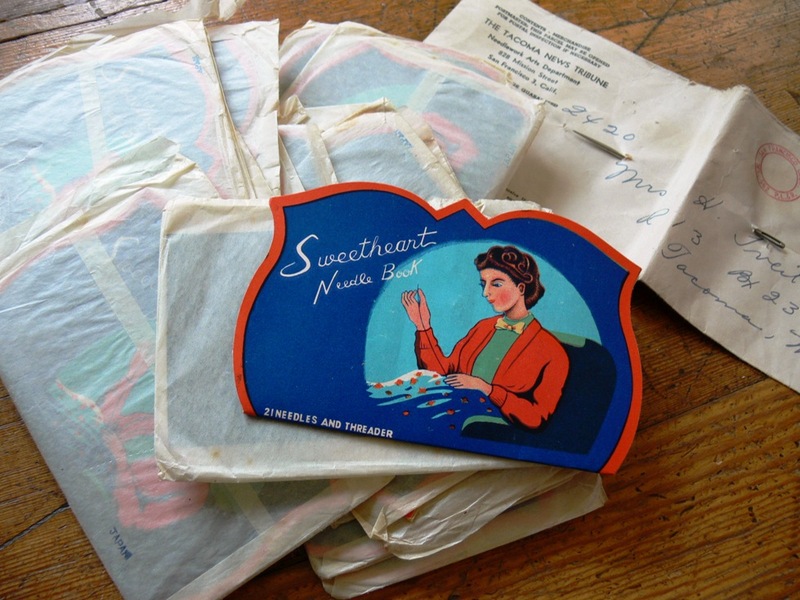 My appreciation of vintage items has grown considerably over the last few years, in great part due to being married to a lover of "old stuff", due also to my friendship with you and being exposed to your taste and thrifty finds, due to my increasing desire to repurpose and upcycle, and finally, due to the ever-growing list of fantastic blogs focused on vintage goodness on my blog reader. For a mix of reasons, you could say! 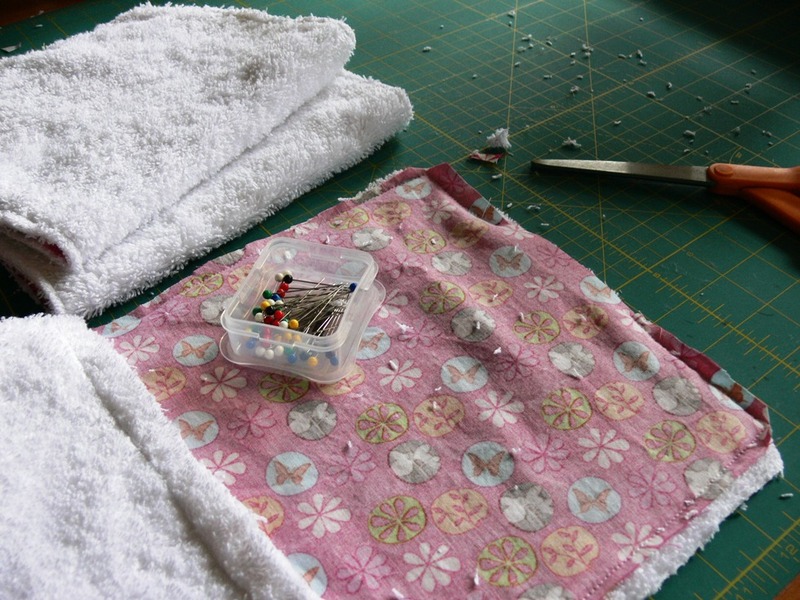 Last summer, when we were staying with my in-laws before our move to Seattle, they got to see me at work crafting and sewing (how awesome were they to let me have a little space to set up my "studio" while we were in limbo?!). And one day, my mom-in-law called me into her bedroom, showed me this box she'd had for years, and told me she wanted me to have it because she thought I might enjoy it instead of letting it gather dust on the high shelf of a closet. 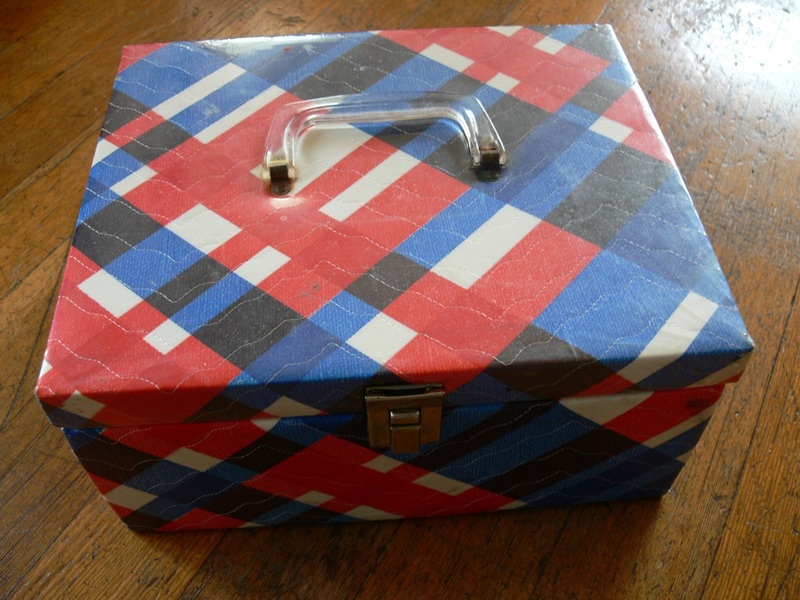 According to my mother-in-law, this sewing box belonged to her mom, my husband's grandmother. I think it is from the 70's, gauging from the pattern and materials it's made of. I am not in love with the look of it, but it is super functional, unlike the crappy plastic box I've been using for years, and I just love the history and connections behind it! * More buttons still on the cardboard, and look at how super kitshy cute the designs are! 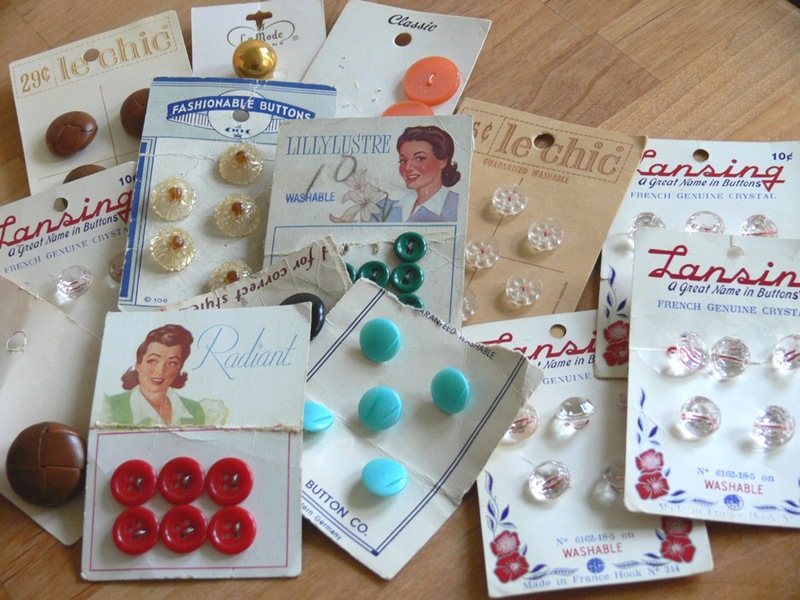 You can tell how old they are by the prices, 15 cents for these, 10 cents for those. 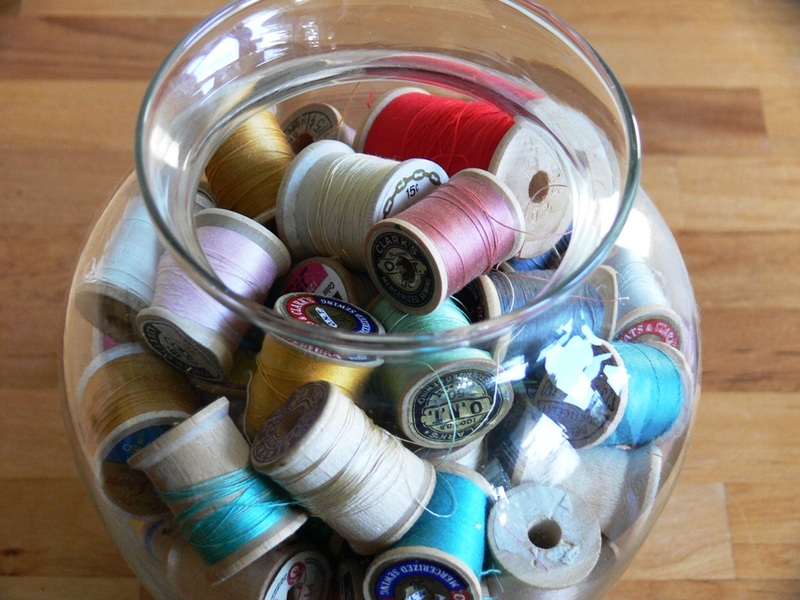 * A few dozen wooden spools, most of them still wound up full of mercerized cotton, or silk! And all the colors are lovely. 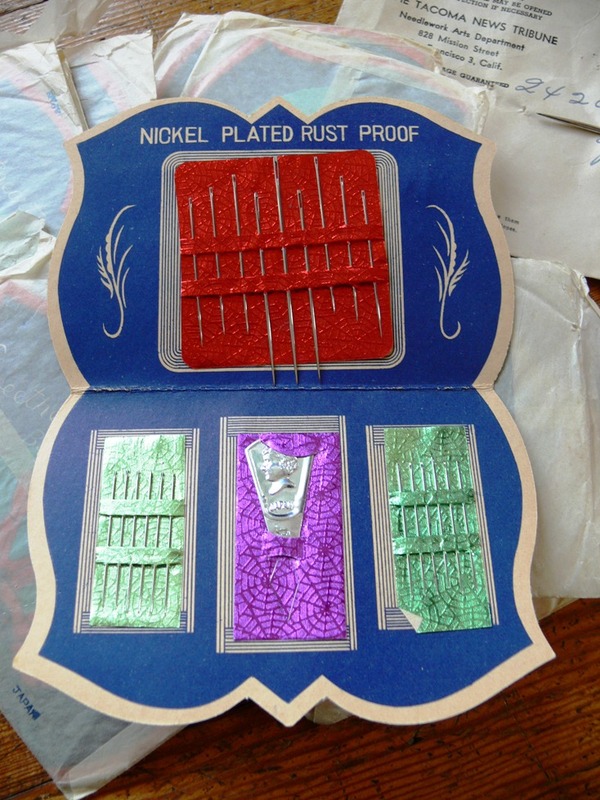 * Inside the pocket, a whole bunch of these little needle books and an old, old envelope punctured by a tapestry needle. 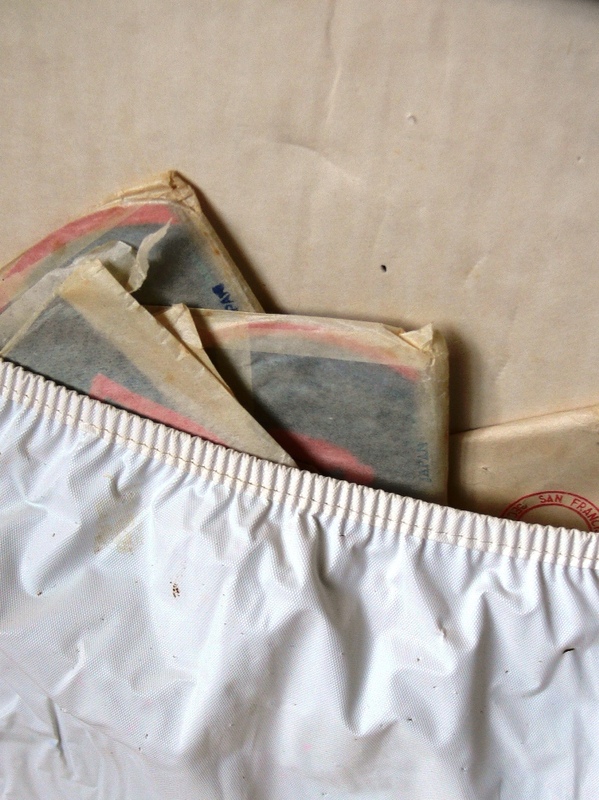 I think a pattern came inside the envelope, I wish I knew what it had been for! I love these little needle books so much, but considering they each feature 21 needles, I can't possibly use them all in my lifetime, so I may have to give some away! Do you want some? I don't know if my mother-in-law is reading this, but in case she is: thank you so much, Lynette! 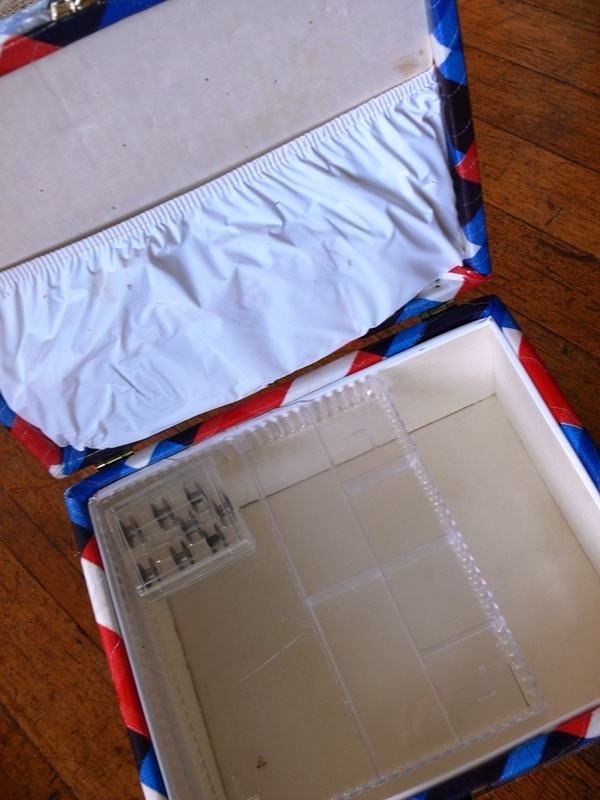 I will cherish this box and its treasures for many years to come!